A letter from A. W. Macfarlane to Henry Shelton Sanford dated January 24, 1885. Macfarlane was the secretary for the Florida Land and Colonization Company (FLCC) from 1884 until its dissolution in 1892. Presumably, he worked in the company's main office, located at 13 Austin Friars in the business district of London, United Kingdom. In this letter, Macfarlane explained to Sanford that the board of directors had rejected a scheme proposed by Sanford as a means to paying company debts. Additionally, Macfarlane offered a brief overview of the company's financial state, noting that the land sales from the prior six-month period amounted to $24,798—over $4,000 more than the same period from a year earlier. Despite this moderate success, Macfarlane bemoaned that "the sales for the last three months are disappointingly small amounting to only some $3,000," an occurrence he deemed symptomatic of a "general stagnation of business in the state." 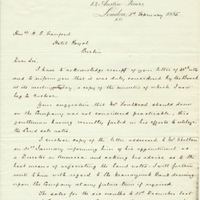 The letter reflected the differing and often opposing viewpoints of Sanford and his fellow board members as well as the limited financial successes of the company in the mid-to-late 1880s. Original letter from A. W. Macfarlane to Henry Shelton Sanford, February 3, 1885: box 54, folder 1, subfolder 54.1.10, Henry Shelton Sanford Papers, General Henry S. Sanford Memorial Library, Sanford Museum, Sanford, Florida. Digital reproduction of original letter from A. W. Macfarlane to Henry Shelton Sanford, February 3, 1885. Box 54, folder 1, subfolder 1.10, Henry Shelton Sanford Papers, Henry Shelton Sanford Papers, General Henry S. Sanford Memorial Library, Sanford Museum, Sanford, Florida. "Letter from A. W. Macfarlane to F. R. Shelton (January 21, 1885)." RICHES of Central Florida. https://richesmi.cah.ucf.edu/omeka2/items/show/3400. Macfarlane, A. W. . “Letter from A. W. Macfarlane to Henry Shelton Sanford (February 3, 1885).” RICHES of Central Florida accessed April 18, 2019, https://richesmi.cah.ucf.edu/omeka/items/show/3402.